The University of Texas Libraries announce the winners of the second "Images of Research" competition. The competition celebrates undergraduate contributions to the research mission of the University by giving undergraduate researchers from across campus an opportunity to present a visual representation of their work, whether in the lab, in the field or in the libraries and archives on the Forty Acres. Undergraduates conducting research as part of their academic experience entered images of their work accompanied by a brief caption explaining the process or outcome for a general audience. Matthew J. Yu (top) — Electrical and Computer Engineering — won first place for his submission, “Into the Eye(s)." Matthew’s submission is a subsection of a Chirikov standard map. As he explains it, the map “was generated by a program that plotted the journeys of five thousand particles over 60 thousand iterations across 9 hours.” Judges felt the image was quite original, offering a glimpse of something most people have never seen - a visual representation of complex data representing chaos theory. At the same time, it stood on its own as a beautiful piece of abstract art. 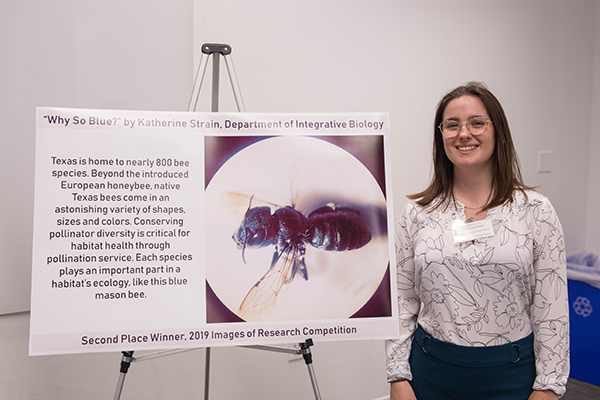 Katherine Strain (above) — Environmental Sciences — won second place for her submission, “Why So Blue?” Katherine’s submission is an image of a blue Mason bee, one of nearly 800 species of bees in Texas, and represents the diversity of pollinators in the state. The judges were impressed with how well Katherine connected the image and text, communicating the diversity of pollinators through an image that challenges the viewers’ assumptions about bees. The two winners were presented with their awards at the Undergraduate Writing and Research Awards ceremony on April 4. Both submissions have been placed in Texas ScholarWorks, the Libraries open access repository. The award, which includes a $100 prize for the first place winner and a $50 prize for the second place winner, was judged by Dr. Lin Winton (Quantitative Reasoning & Independent Inquiry Flags, School of Undergraduate Studies), Dr. Robert Reichl (Undergraduate Research, School of Undergraduate Studies) and Dr. Madison Searle (Honors Center, College of Natural Sciences).